Imagine that you find a book at a garage sale and suddenly the main character steps out of the pages to be front and center before you! 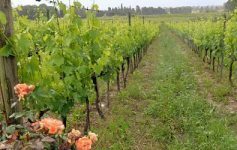 That amazing character, Dario Castagno becomes our “in-person” tour guide in Siena, Italy, as well as his family’s winery in the Chianti region. Hello everyone, it’s Paul Scopel from You, Me and The Dock. Dario is the author of some hilarious and informing books about the locales. He also mentions some zany characters that have toured Tuscany with him over several decades. 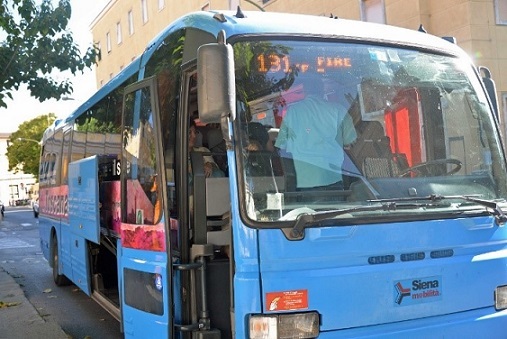 After establishing our base for several days in Florence, we rode a modern intercity bus to nearby Siena. This is where we will intersect with Dario. 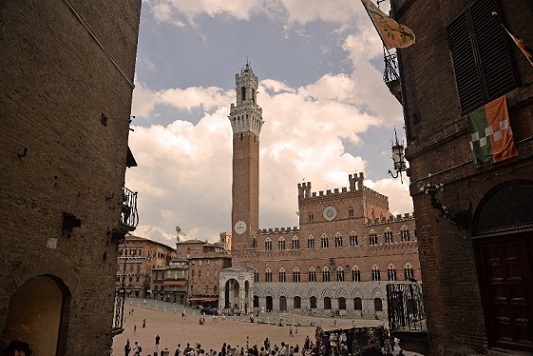 Siena is a beautiful city of burnt orange architecture with a picturesque – oval in shape central plaza called the Piazza del Campo (shown above right). The tile roofed buildings of the piazza are awash in tones from your childhood crayon labeled “burnt sienna”. The color originates from the tones of the local soil. 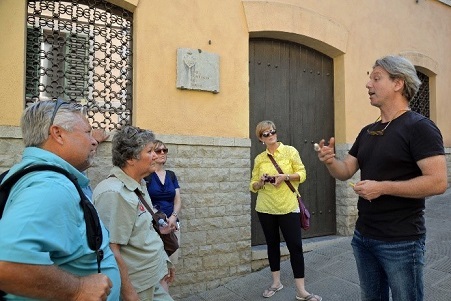 Dario engaged our imaginations immediately as we strolled to his contrada’s (neighborhood – shown below right) headquarters. 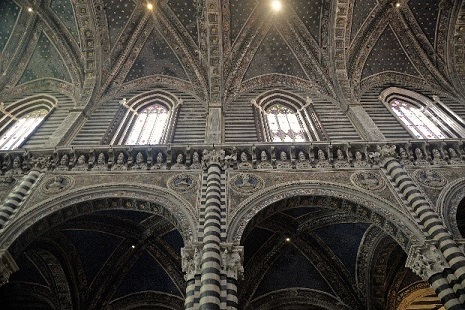 Today there are 17 official contradas or districts in Siena. 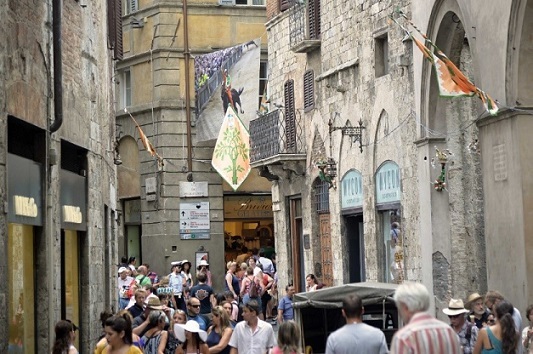 Each contrada’s headquarter centers its existence and rituals around the contrada “family” and the Palio. The Palio are two highly competitive horse races in the Piazza del Campo. The two Palio races are the equivalent of the Super Bowl of Siena. The races and accompanied festivities are held July 2 and August 16 annually. On race day, the Piazza is packed with over 60,000 cheering fans. In each race, ten of the contradas participate each year with 7 racing by “right” and 3 others chosen by lottery. Four days of Renaissance pageantry lead up to the races. The life or death races pit the 17 neighborhoods of Siena or contradas against each other. 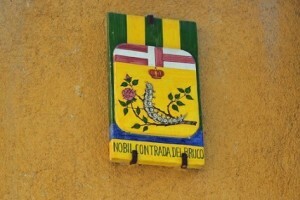 Each contrada has its own government, coat of arms (shown left), titles, representative, patron Saints and territorial boundaries. A Sienese citizen is raised in a contrada by virtue of the district where they were physically born and remains their contrada for life. Behind an obscure and meek entrance, the elaborate headquarters contain display halls, a chapel, massive gardens and meeting areas. At regular intervals, hundreds of contrada residents are fed on the spacious grounds hidden behind a humble, but solid façade of burnt orange sienna plaster and brick (shown upper-left). Like any sports team, each contrada bears a centuries old symbolic mascot. 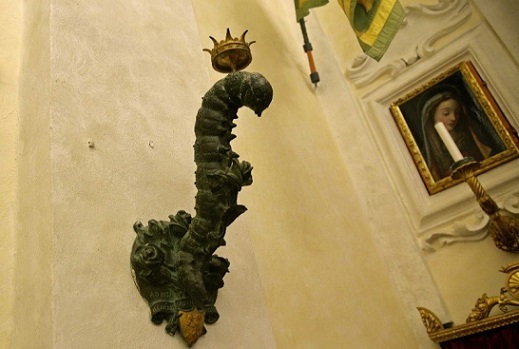 Dario’s contrada is the Contrada del Bruco, or “the caterpillar” (shown right). 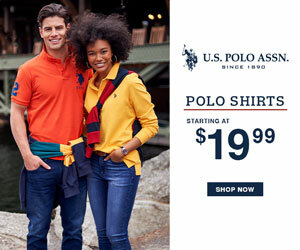 The designation of the “noble” was added in the 1300s when members were rewarded for their aid and political intrigue. Street lamps, flags and wall sconces evoke the magic of the caterpillar and its transformation. Other contradas use magical mascots such as the dragon, she wolf (euphemism for a prostitute), owl, elephant, rhinoceros, snail and so on. 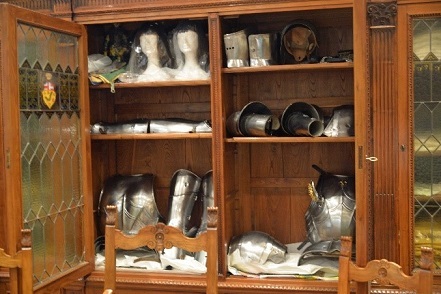 Dario explained the ancient rituals and today’s protocol for the Palio, which includes our hands-on review of the elaborate costumes and armored suits worn by the participants. 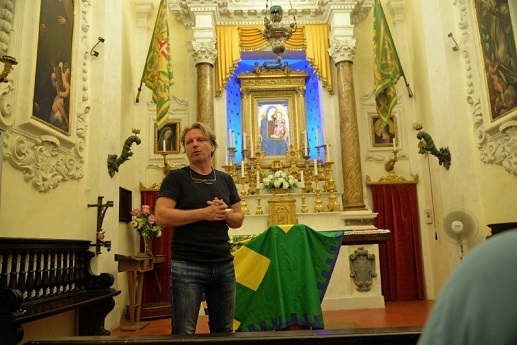 Race day starts with the blessing of the horse in the contrada’s chapel (shown right). Other related services are not held in the beautiful chapel – its only purpose is the blessing of the horse by the contrada priest. Bursting into the streets are parades of brightly uniformed members in armor and fabric (see below) who march by drumbeats. Neighboring contrada headquarters make house calls on allies to avoid any potential rivaling controversies. It is the Renaissance rebirth where thousands of spectators who are glued to their places in the center of the Siena Piazza del Campo, await the musicians, enactors, jockeys, and the stars – the horses. Amid the drums beating, and bells ringing, the level of delirium rises. The race lasts less than two minutes and then the party begins! The contrada winning the race is entitled to bragging rights and is awarded a cherished prize, which is a hand painted silk flag. 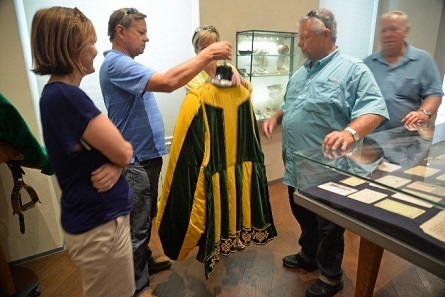 The “Pallium” is an elaborate and enormous flag that was designed in an artists’ competition. 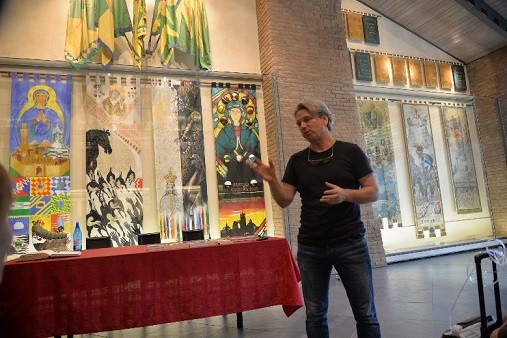 All of the beautiful Pallium flags won by Contrada del Bruco over the centuries are proudly displayed in the headquarters (pictured, above right). Re-energized from this treat, we headed to the Piazza del Campo (shown right). 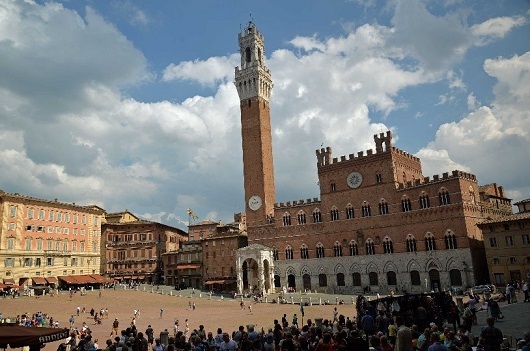 This is the center of Siena and the site of the Palio races. 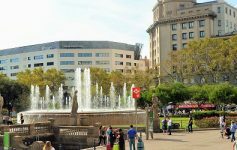 On a normal day like today the square is teeming with tourists checking out the many shops and eateries surrounding the perimeter. We found a comfortable perch in a little wine café overlooking the action and imagined the roar of the crowds and the thundering hoof-beats. It is one of our many encounters with La Dolce Vita. Our next stop is to my favorite Cathedral in all Europe, and that is the Siena Duomo (shown right). 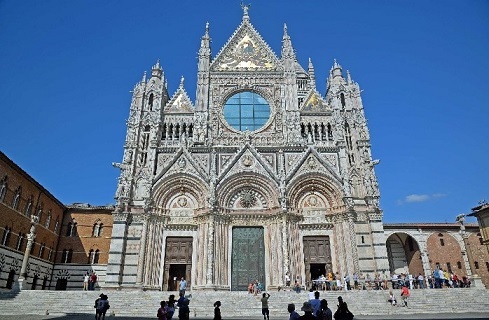 The Duomo is a French Gothic and Tuscan style medieval masterpiece of white, greenish-black and red marble. Originally built over a ninth century church, the replacing structure was completed in 1263. The cathedral’s interior is more striking and beautiful to me than the Duomo in Florence. Lining the perimeter of the ceiling are 172 busts – heads, shoulders and chest of previous popes. I particularly like the symmetry of the pillars and the walls that are interlaced with black and white marble. It’s a feast for my eyes. 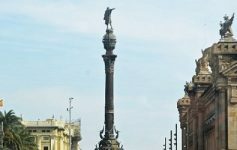 The Duomo is resplendent with many works of religious art, sculpture, and liturgical pieces by famous master craftsmen. 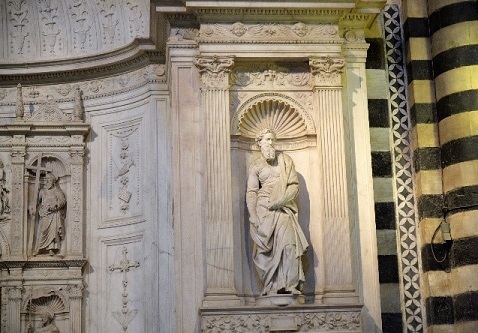 This includes the statue of St. Paul sculpted by Michelangelo (shown above-right). This year Dario’s Contrada has won the lottery to compete in both races. Good luck to the caterpillar! We said our good byes for the day and headed to lunch. 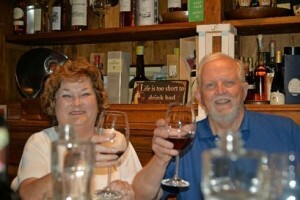 We dined on delicious Italian dishes and wine from the Tuscan area. Fortunately our time with Dario was not quite over yet. 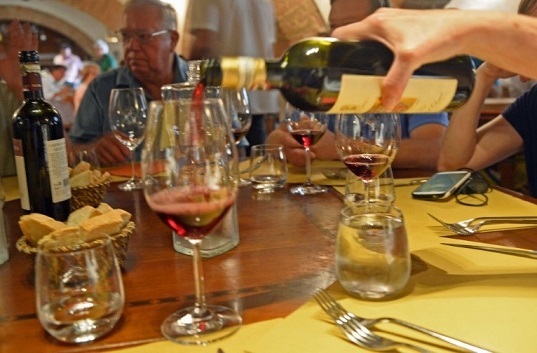 The next day we traveled to his Tuscan family’s vineyard in Chianti to experience the rolling countryside and splendid winery that included an authentic prepared Italian dinner. Siena, Italy, with the exception of its many hills, is a pretty easy town to maneuver through. Having comfortable walking shoes is a must. Experiencing famous places and sights is an obvious goal of travel. You could be greatly enlightened for going beneath the surface to learn what makes the locals tick. Getting under the skin of a city is aided with a professional native like Dario. Dario’s humor and captivating story telling skills made this day a strong highlight of our trip to Italy. 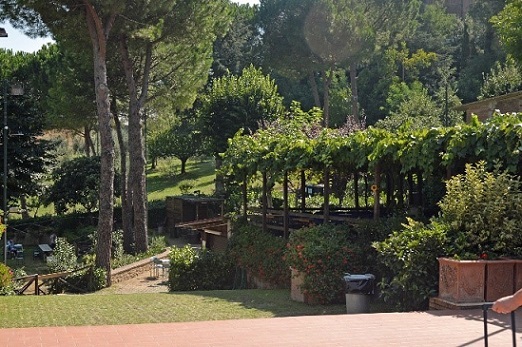 You can find his books and CDs such as A Day in Tuscany, Too Much Tuscan Sun and Too Much Tuscan Wine on the internet. Join me again for more exciting adventures with my next article – buon appetit0!